How many times have you passed by a fruit stall and seen some unusual fruits, some that you never came across of until now. One in particular is the Genip fruit, it is now in season and is being sold in the various streets or fruit stalls. The fruit is a green round grape like fruit. But how does it taste? 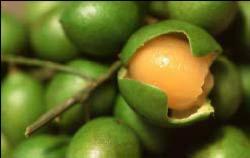 Well, the Genip or “waya” as it is commonly called in Spanish is a one-inch, round Caribbean fruit with a green leathery skin and sweet, juicy orange pulp. This very tasty and succulent fruit is a family favorite, especially favored by the kids. The fruit clusters are branched, compact and heavy with nearly round, green fruits tipped with a small protrusion, and suggesting at first glance tiny, unripe limes, but there the resemblance ends. The skin is smooth, thin but leathery and brittle. The glistening pulp is salmon-colored or yellowish, gelatinous, and juicy, but very scant and somewhat fibrous, usually clinging tenaciously to the seed. When fully ripe, the pulp is pleasantly acid-sweet but if unripe acidity predominates. For eating out-ofhand, the rind is merely torn open at the stem end and the pulp-coated seed is squeezed into the mouth, the juice being sucked from the pulp until there is nothing left of it but the fiber. Since the fruit is now in season, you may see it commonly being sold on the streets. As per usual, you can purchase these yummy fruits at your local fruit and veggie stall at Antojitos Letty’s on Pescador Drive.